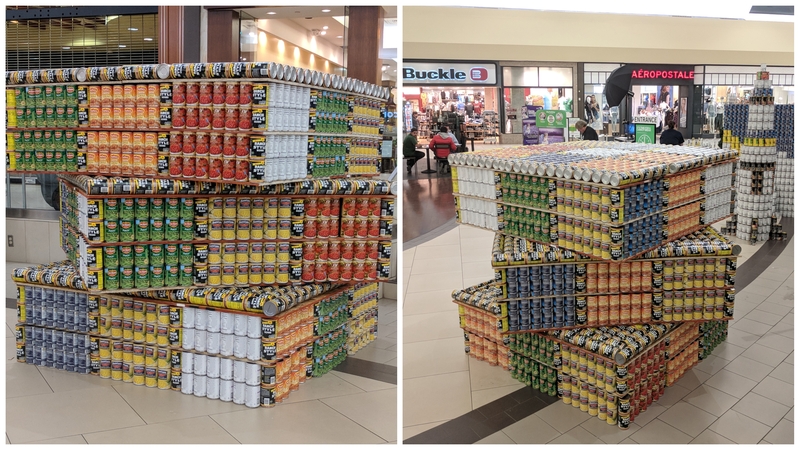 UPDATE: Voting for the 2018 CANstruction Reno People’s Choice Award is now closed. 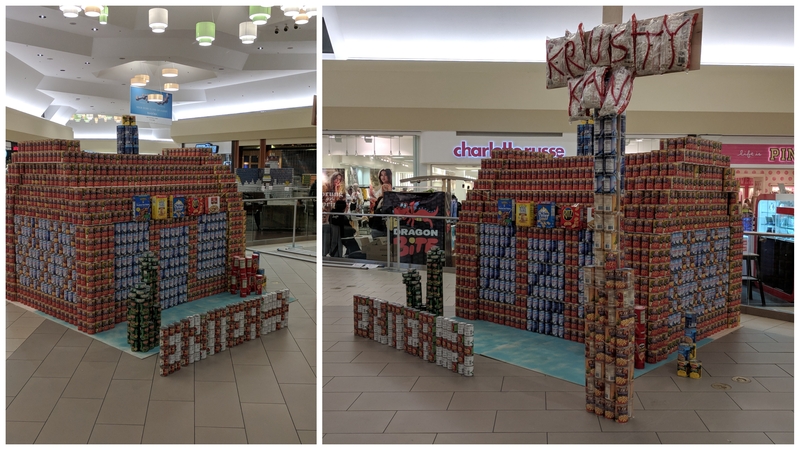 CANstruction Reno, benefiting the Food Bank of Northern Nevada, is back for it’s 15th year! 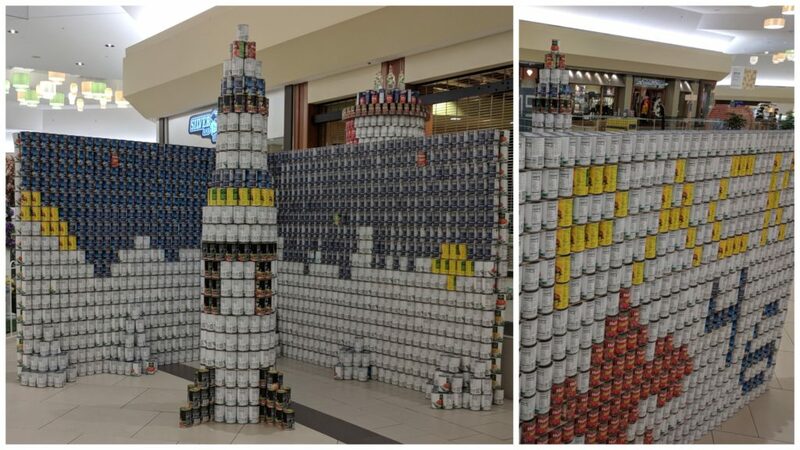 From outer space to the ocean floor with a couple Reno landmarks along the way, this year’s CANstruction competition masterpieces will take you on a journey. 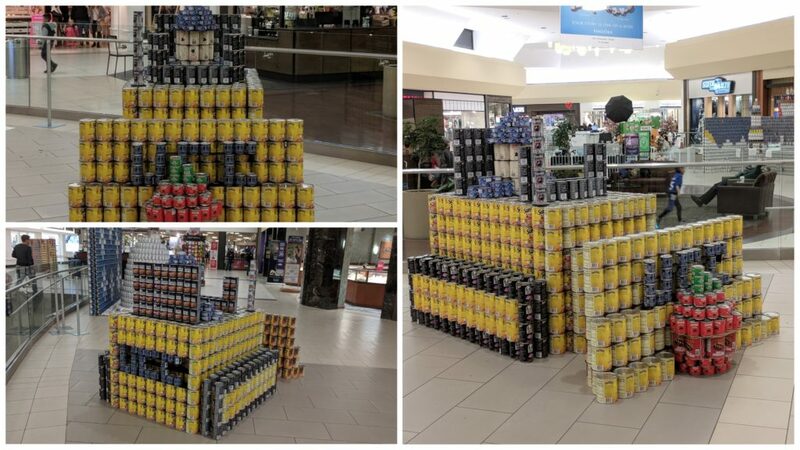 10 teams will use a total of more than 23,000 cans to create awe-inspiring art sculptures out of canned food. Which will be your favorite? 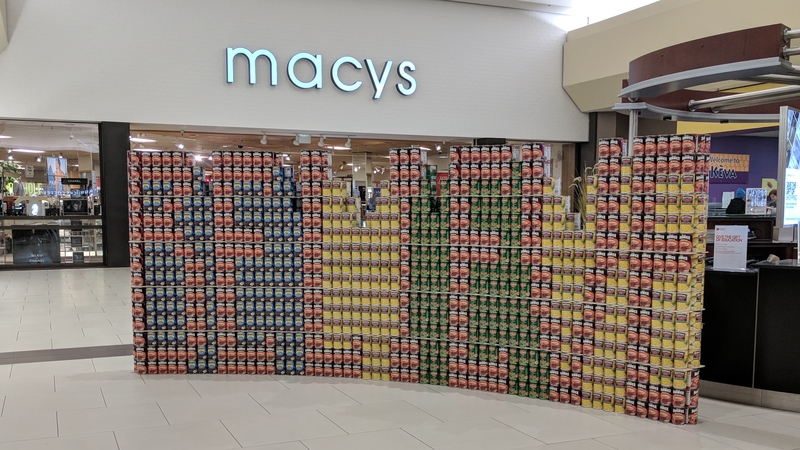 The event, taking place in Center Court at Meadowood Mall, kicks off on Wednesday, March 7 with a 12-hour build day, during which teams will construct their canned food masterpieces. The next evening, teams will gather at Meadowood Mall for an awards ceremony, where the winners of several categories, selected by a panel of judges, will be announced. But one very important and highly sought award will be up to YOU – the People’s Choice Award will be presented to the team with the most votes cast during the week-long voting campaign. Structures will be up for viewing at Meadowood Mall through Sunday, March 11. Viewers can vote for their favorite sculpture at the Guest Services desk during regular hours Wednesday-Saturday. Online voting opens at 8am on Wednesday and closes at 6pm Monday, March 12. Every vote costs $1, with all proceeds from voting benefiting the Food Bank of Northern Nevada. Voters will also be entered into a raffle for a $50 gift card from Meadowood Mall merchant Silver & Blue Outfitters. Check out this years masterful entries, then cast your vote at the bottom of the page. The Rubik cube was created in by a professor in Hungary in 1974 to help students understand three-dimensional problems. Inkers created this colorful cube to provide meals to families in need. Twist and turn this canned formation to build a variety of meals. Brrr…..it’s penguin-ing to feel a lot like winter. The students of Kendyl Depoali Middle School are using their glowing hearts to build an igloo made of healthy canned foods to help make warm and cozy meals. The students have the assistance of K.D. the penguin, and are asking for your help too. Together, we CAN “freeze out hunger” so everyone CAN have n-ice meals. 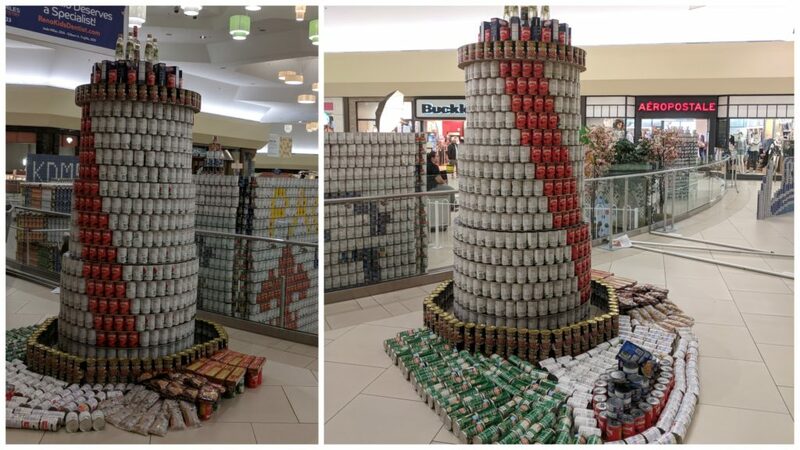 Our Team has created a lighthouse , incorporating a mixture of white assorted vegetable cans to create a classic look. We will be inserting our red olive cans to bring out a cool red showing a different color design. Surrounding the lighthouse at the base, will be an assortment of mixed cans to make our land and water and maybe a boat or two! TEAM 4: CORE Construction/TSK Architects/Lumos & Associates | Reno CAN Beat Hunger! Our team of Northern Nevada construction, architecture, and engineer experts have recreated the iconic Reno Arch. At the beginning of this process, the arch was in its original form – red and white. As the transition to silver and blue began, our team quickly acted to redesign our structure to reflect the new change. 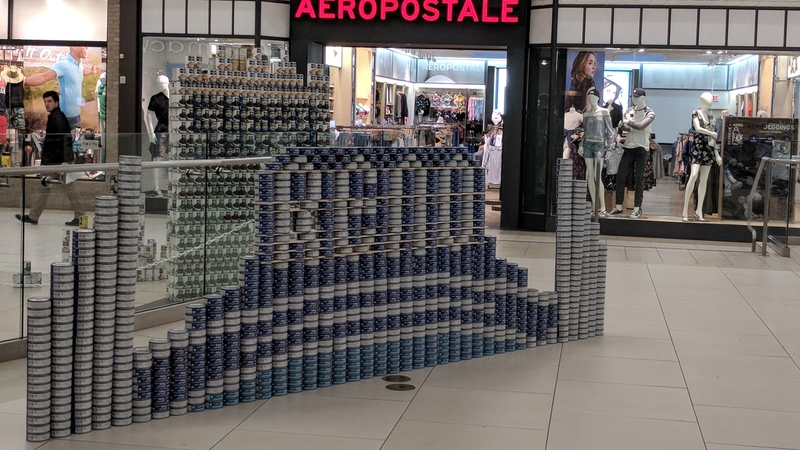 Our structure is made of blue and white tuna cans and Nevada Pride! 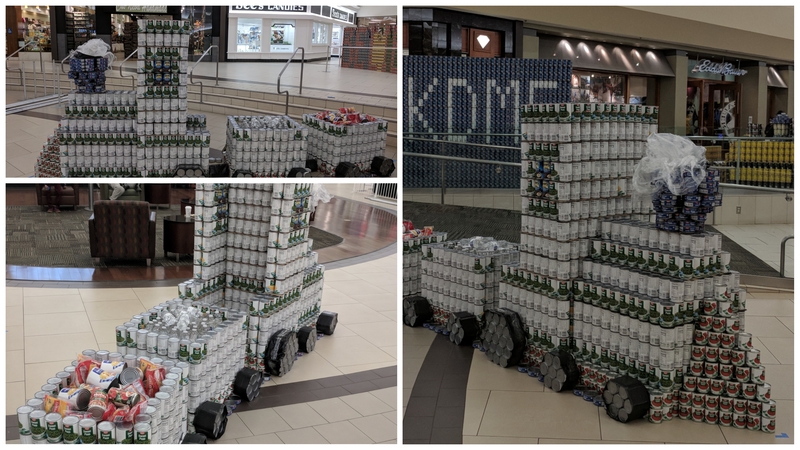 Our Reno-based team embraced the community aspect of this competition and is excited to not only have the oppor-TUNA-ty to honor it, but to give back to it. Together, we CAN beat hunger! We’ve created a scene that pays homage to the astronauts of yester year and to the explorers of tomorrow. Our rocket, designed after the Saturn 5 rockets that propelled American astronauts to the moon, is constructed of WinCo Golden Sweet Corn, chosen for the abundance of white on the label. Stagg Chili, Del Monte Peaches, and Bush’s Black Beans provide a few decorative touches to our explorer’s craft. The alien moon our explorers landed on is displayed using WinCo Carrots and Bush’s Black Beans for the exotic night sky, complete with a planet rise on the horizon. The Food Bank of Northern Nevada operates each day with the assumption that when we work together, just about anything is possible. Like solving hunger in our communities. 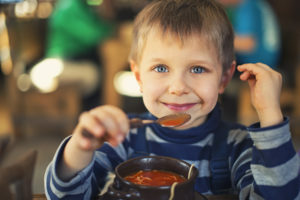 We have the solutions and we know what to do to help the one in five children who struggle with hunger to get connected with the food they need to grow, learn and thrive. We know how to make sure that our seniors who are having difficulty managing the costs of their medical care and groceries get the food they need to maintain a healthy lifestyle. But what makes us “Believe” that all of these things are possible is witnessing the generosity and caring of those who help us make it happen. Supporters of the Food Bank know that every dollar helps to provide three meals and that each hour of volunteer time is important beyond words. We couldn’t do it without YOU and your support, and you make us “Believe” in a hunger free future for families who live right here with us. Thank you! You’ve woken up in a post-apocalyptic world. Buildings have been destroyed and food is scarce. This is our idea from Fallout, a post-apocalyptic video game and our figure is the character Fallout Boy. We made a two dimensional billboard style structure which is surrounded by fallen buildings that represent the survival in the game. 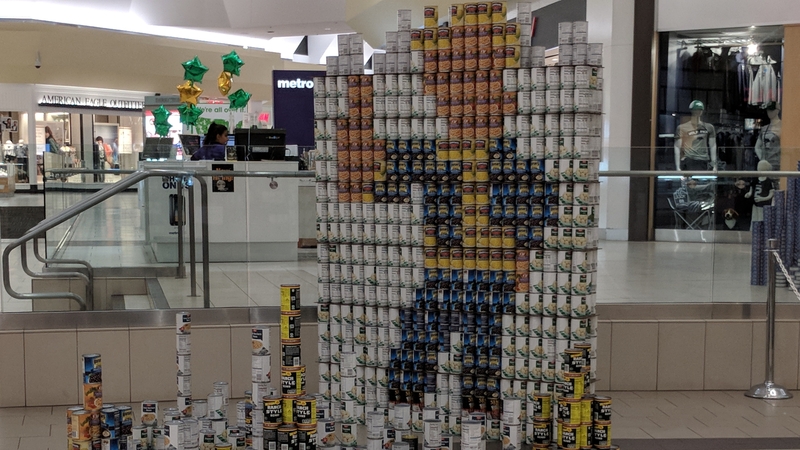 Fallout Boy’s vault suit and our school’s name, Shaw is made up of Bush’s black beans, his face and hands are built with S & W cannellini beans. Ranch Style beans construct his shoes and eyes. Santium corn adds the details to Fallout Boy’s vault suit and his hair. To fill out our billboard we used Winco brand potatoes. It is our hope that with our Shaw-some billboard it will help people “Fallout” of hunger. It’s Hip! It’s coral! Join us at the Krusty Kan for a KANny Patty or two. You’ll feel like you are at the bottom of the Pacific Ocean when you swim up. From afar you may see our clamshell sign and as you get closer, our carefully planned proportions and detail will welcome you as if you were SpongeBob SquarePants or Squidward Tentacles showing up for work. Mother of Pearl! Instead today folks you will be our guests! The main structure 8’-0” x 5’-0” x 5’-4” is made from S & W pinto beans which was chosen due to its bottom of the sea-brown color to imitate the wood-like texture of the Krusty Krab and of course it’s low sugar, high protein and nutritious fiber. Coconut milk and Progress Soup were chosen as windows because of their iridescent qualities and they are both great sources of healthy fat, protein and vitamins. It was important to include some Chicken of the Sea and clams for scent and texture as well. The flags were chosen from cereal boxes to capture your attention and keep you from that Bottom feeder of an establishment – Chum Bucket. The chew chew train symbolizes the journey out of hunger and poverty, moving towards a healthy supported lifestyle. This primarily white train represents a blank slate or new start, but the colors symbolize the change that has already begun, starting with this project. We chose a variety of staple foods including sweet peas and corn, tomato sauce, with proteins such as tuna. The chew chew train symbolizes new opportunities , it is pleasing to the eye and stomach. Our sculpture is a representation of a United Construction worker on a bulldozer providing food to the community in the form of a large apple. United Construction is celebrating our 40th year in Northern NV. As a whole, our company and its employees have eagerly dedicated many volunteer hours to the Food Bank of Northern Nevada, and we are continuously seeking opportunities to be involved in giving back to our Great Community. 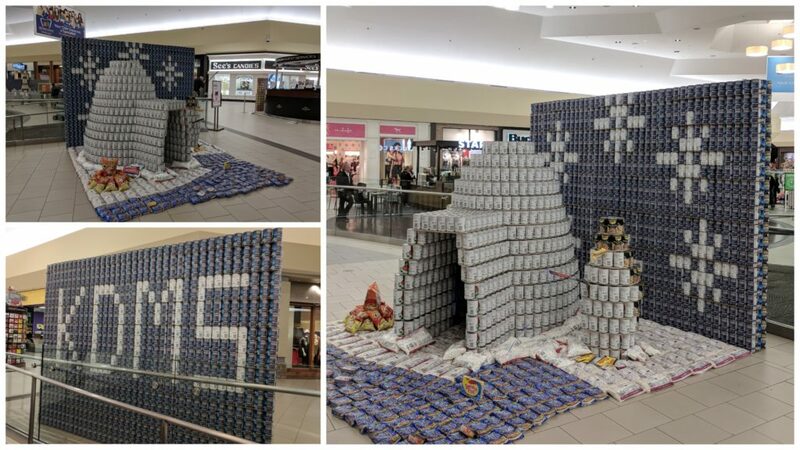 CANstruction is organized by American Institute of Architects of Northern Nevada and made possible by presenting sponsor Growing Smiles Pediatric Dentistry, Jade Miller, DDS & Gilbert A. Trujillo, DDS. Additional CANstruction sponsors include John Anderson Construction, Basalite – Sparks, and Fred & Janice Graham. CANstruction is also supported by Meadowood Mall, Alice 96.5, Connie Wray, Winco, Freeman, Cooks Photography, Digiprint, Nevada Blue, Silver and Blue Outfitters, and KTVN Channel 2.